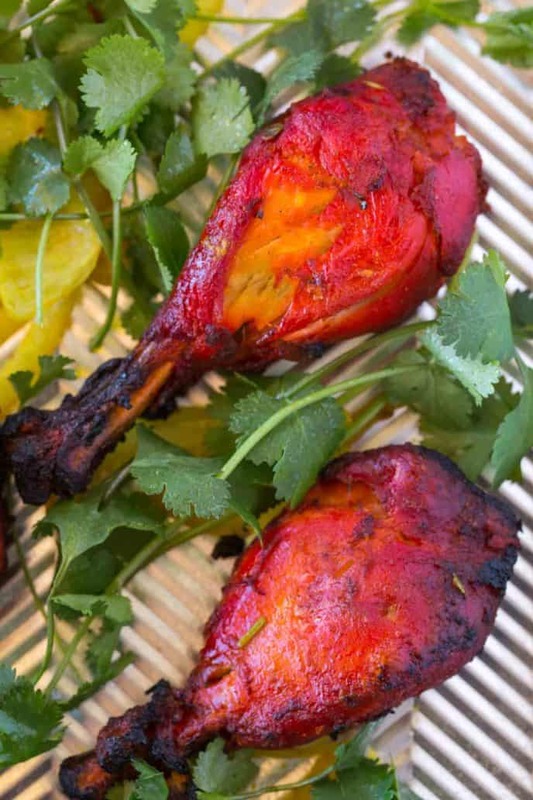 Classic Tandoori Chicken is an Indian recipe that’s marinated in yogurt, garam masala and cayenne before baking made easier, a perfect weeknight meal. 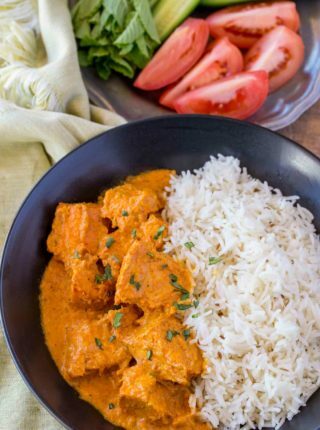 We are enjoying the new Indian recipes showing up on the blog including Butter Chicken, Vegetable Biryani, Chicken Tikka Masala and Raita. Tandoori Chicken was the obvious next recipe I wanted to share after the other chicken recipes have been SO popular with you guys. This recipe was actually a mix between trying to stay true to the classic restaurant favorite recipe while making an easy weeknight meal. I settled on using chicken legs for one reason alone. Every time I would make tandoori chicken for clients I would buy the fryer pack of chicken from the store. This meant I’d have 8 pieces to cook that included chicken breasts, thighs, wings and legs. Every time I would make the recipe the first pieces to go were the legs! Soon I found myself making just thighs and legs, but even then the first things to go were the legs. So now, when I make this recipe for my family or clients I stick to chicken legs. Why you ask? Well the legs are tender while cooking quickly. They have just enough meat to stay tender while getting a slightly crispy exterior from the marinade. This means more of the meat is super flavorful. With thighs I would see people eat all the parts of the chicken covered in the marinade while leaving the extra meat on the inside. Chicken breasts were an issue only because with the high heat of cooking to get the right char I was finding the white meat was drying out a bit. Chicken legs are the perfect easy option here. 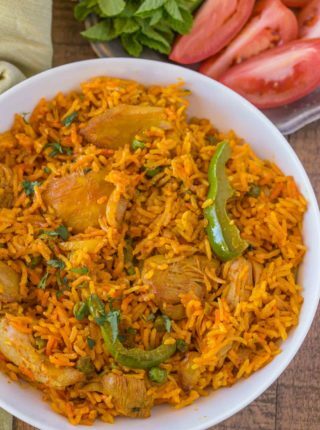 Want to make this recipe with a different cut of chicken? I highly suggest cutting through the meat to allow the marinade to flavor more deeply into the chicken. This can be done once you remove the skin, you would cut deep x marks into the thighs or breasts almost to the bone. 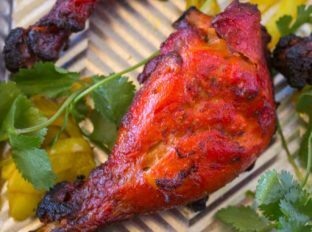 Tandoori Chicken is classically served in restaurants in a bright red hue because of the addition of a few drops of red food coloring. You can create a similar color with the addition of harissa paste and turmeric if you are averse to using the red food coloring. What is Tandoori Spice Mix? The spice mix can be combined and stored for future use, this spice mix makes enough for two pounds of tandoori chicken when combined with 2 cups greek yogurt. 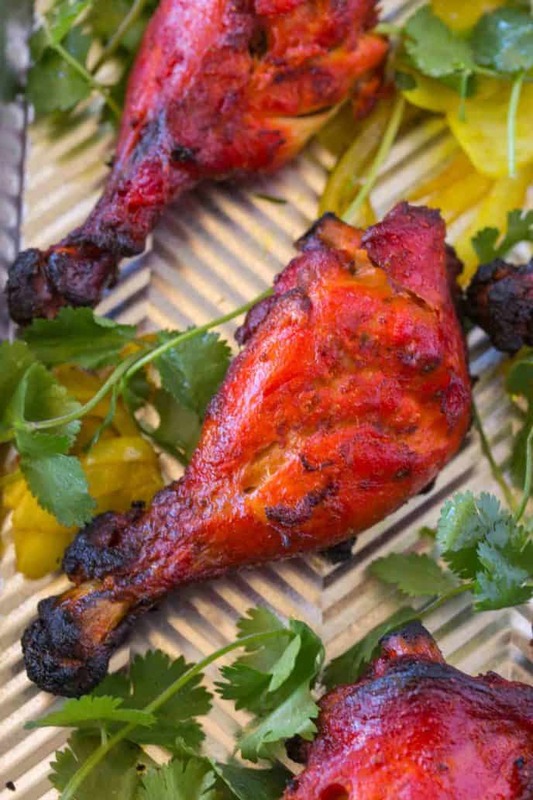 The classic charred look of grilled tandoori chicken can be replicated in the oven. Cook the chicken at 400 degrees for 25-30 minutes, turning once halfway through cooking. 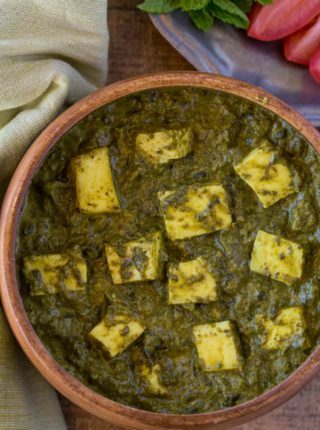 Don’t have garam masala? You can make your own garam masala spice mix at home! 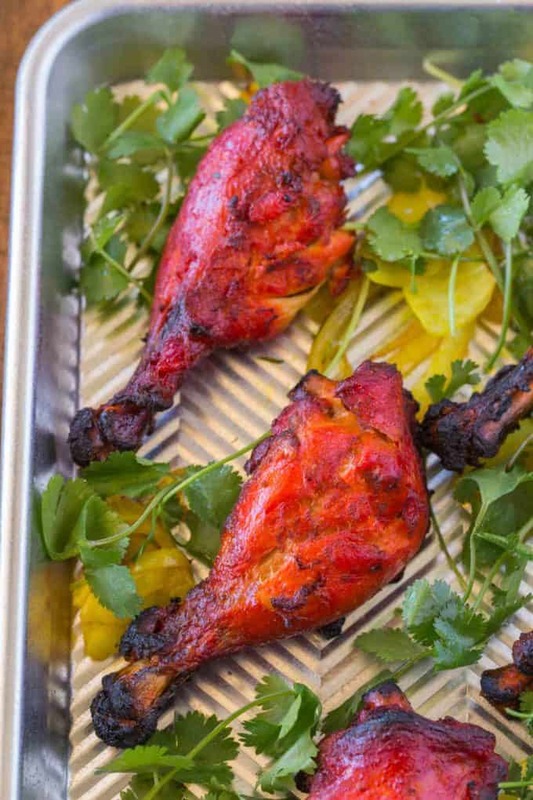 Classic Tandoori Chicken is an Indian recipe that's marinated in yogurt, garam masala and cayenne before baking made easier, a perfect weeknight meal. Cut very shallow little lines into the de-skinned chicken legs and add them to a large bowl or a zipper bag. Add the rest of the ingredients to the chicken and mix well (I use a zipper bag and just sort of squish it all around). Let marinade in the refrigerator for at LEAST 8 hours, preferably 24 hours. Remove the majority of the marinade before cooking the chicken. Heat the oiled grill to medium-high heat and cook the chicken until cooked through, 10-12 minutes. Preheat the oven to 400 degrees and cook on a sheet pan for 25-30 minutes. Hi is there an alternative to kosher salt as that’s only thing couldn’t get. You can use a coarse sea salt or even table salt in a pinch. Enjoy! Will be attempting to recreate this fabulous looking dish this week , an all time favourite of mine , I will post pictures IF I succeed . Thank you for the recipe. Is there a stove top alternate to grilling? Kindly let me know. If you don’t have a grill pan, you can also use a cast iron skillet. I hope you enjoy it! I made this the other day and I was unimpressed, the spices needed to be a bigger amount and the yogurt was to thick. I know that if I can modify it, the recipe will be much better. Didn’t see why skin-on chicken wings wouldn’t work, and they did! Easy prep and very tasty. Marinated for 2 hours and baked at 400°F for about 22 minutes per side. No added color necessary. Bet you can’t eat just one. Thanks for the feedback! So glad you decided to try and loved it! the grill OR the oven? Was just curious, if using Harrisa and Tuneric instead of food coloring. How much of each do you suggest? Actually preparing marinade today! Sounds so good! I’m not really sure how much to use….you might just need to start with a little and eyeball it. Hope you enjoy! This looks amazing!!! Do you have any suggestions on sides? I cannot wait to make this! Thank you! I would suggest roasted vegetables or even my Vegetable Biryan. The ingredient list has “1-tsp Cayenne pepper” listed twice. Is that correct? This sounds amazing! I love tandoori! Thank you so much Ann! It’s a crazy life but I love it! I love how crispy is this chicken! Yummy! 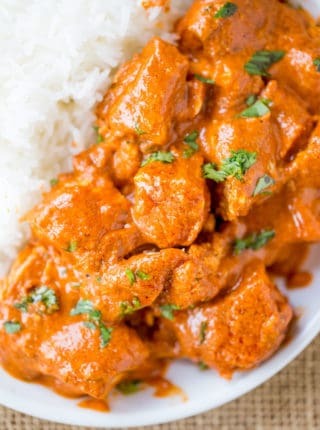 I love tandoori and that looks absolutely perfect! These chicken legs look amazing! I’m always looking for more chicken recipes, and this one sounds perfect for my family! Such a great way to switch up your chicken routine!